Renaissance architect Baldassarre Lanci designed the fortress town of Terre del Sole for Cosimo I de’Medici in the 16th century. The site is thought to be the ancient town of Solona, once mentioned by Pliny. In the 16th century, the use of firearms in offensive military actions required strong defensive walls, and indeed, the walls that surround the town are 9-meters thick in places. 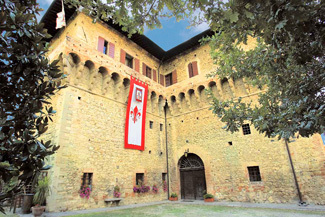 Within the town walls are two castles, of which il Castello del Capitano delle Artigliere is one. On occasion, the historical battle between the forces of Florence and Rome is reenacted, complete with crossbows and shots, while participants dress in Renaissance attire. This is the perfect spot to get away from the crowds. When you sit outside and watch the sun set over the hills of Romagna, you’ll know it won’t get much better than this. Rates include breakfast, service, and tax. Discounts for a one-week stay or longer. Possibility of exclusive use of the castle. Terra del Sole is about 60 km southeast of Bologna. From A14, take Forlì esit and follow SS67 Tosco Romagnola for about 8 km. The nearest train station is 10 km away in Forlì, from where there are bus connections. Nearby: spa; golf; sailing; hiking; horseback riding; bicycling; tennis; museums, castles, and churches of Ravenna, Faenza, Forli, Cesena, Rimini, Ferrara, Florence, Siena, Perugia, Venice, Bologna, and San Marino; Ducati factory in Bologna; Ferrari in Maranello; visits to producers of olive oil, wine, cheese, ham, pasta, and fruit. Yes, civil ceremonies by town mayor. Inquire for further information. A special experience awaits you at this intimate castle set within the walled village of Terra del Sole. With only three rooms, you feel more like a guest in someone’s home, and indeed, your attentive hostess, Anna, will make you feel very welcome. You have a choice of three fantastic, well-appointed, and spacious suites. All rooms have Wi-Fi connectivity. The Cardinale Suite features a canopied bed and access to a private terrace, while an adjoining room has a wood-burning fireplace. The Famiglia Medici Suite also has a wood-burning fireplace, access to a private terrace, and stand-alone vintage bathtub with a view out the window of the rolling hillsides. A wonderful coffered fresco ceiling is featured in the Gran Duca Suite, along with a Jacuzzi and your own piano. A lovely breakfast is served in a sunny salon or it can be brought to your room in the morning on request. Your hostess Anna is always on hand to suggest the area’s best restaurants and wineries or places to shop for everything from clothes to Italian shoes. Or if you prefer exploring the nearby art towns and museums, she can gladly point the way—if not accompany you!